Question: Have you finished your holiday shopping yet? My answer: Not yet. But as of this Friday, it’ll be done and dusted, with just the wrapping left to do. Hooray! I don’t know about you guys, but I don’t really view Christmas shopping as the stressful activity that a lot of movies and marketing make it out to be. I think the bit we find stressful is the waiting – the having to wait in lines and in traffic – both of which could make us late for wherever we want to go next. We all (myself included) constantly talk about not having enough hours in the day to get through our to-do lists, and I think it’s more so the prospect of wasting time waiting, rather than the act of Christmas shopping itself that we get stressed about. With that said, in today’s digital age, it’s nice that we don’t necessarily have to do all that waiting. This year the majority of the things I’ve bought for friends and family have been purchased online, and I actually still really enjoy the tactile experience of going into stores. I’m totally aware however, that the experience might not be quite as enjoyable as we get closer to the 25th. 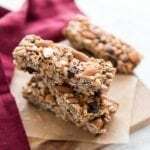 If that sounds familiar, today’s No-Bake Almond Chocolate Chunk Granola Bars are for you. 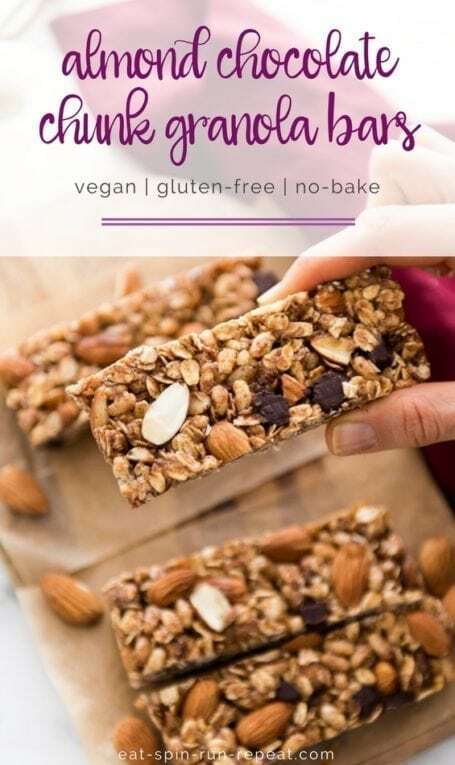 And even if that’s not you, but you like really yummy things (that also happen to be healthy), the recipe is for you too. 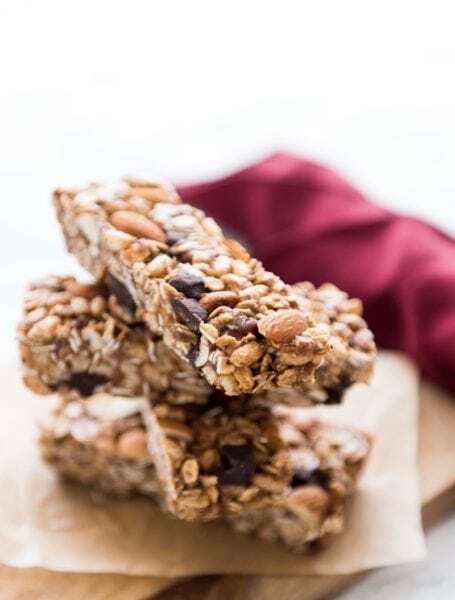 I made these Almond Chocolate Chunk Granola Bars a couple of months ago, and completely forgot about them until this past weekend when I was scrolling back through my photos in Lightroom. Some sort of holiday power snack seemed like a good idea, and because the holidays are a busy time, I’ve kept these super easy: no oven required, just one mixing bowl, one small pot, and a few simple whole food ingredients. These hold up really well when wrapped individually, so they’re perfect for tossing in your bag on the way out the door to run errands. On the other hand, if you’re just sitting at home and shopping online in your jammies, I happen to know for a fact that they taste lovely with a cozy cup of tea or a latte. ?Enjoy! 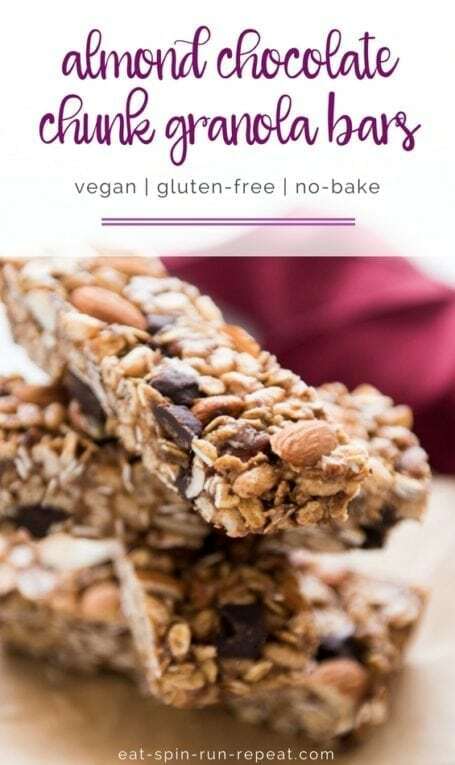 These vegan No-Bake Almond Chocolate Chunk Granola Bars are a perfect for busy days when you need a healthy snack or breakfast on the go. Combine the first 6 ingredients in a large mixing bowl. Set aside. Place a small pot over medium heat on the stove. Add the brown rice syrup, maple syrup, almond butter and vanilla to the pot, whisking to incorporate. Once smooth and runny, pour this into the dry ingredients. Stir well with a spatula, coating the dry ingredients. Transfer the mixture to the lined baking dish. Press it down as firmly and evenly as possible into a single layer, pushing it into all 4 corners of the dish. Freeze for at least 5 hours. 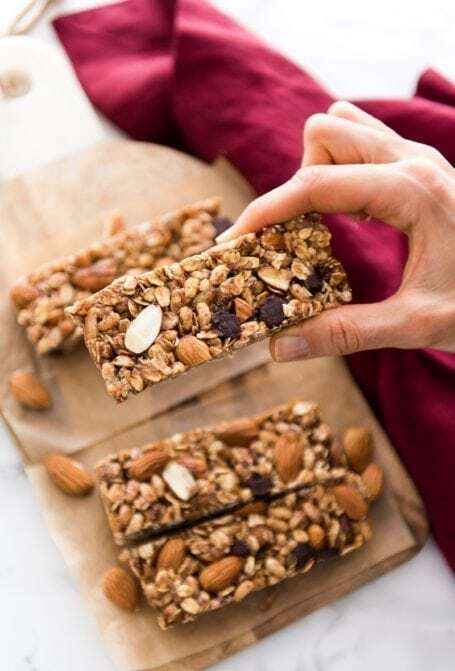 Once firm, remove the block from the dish and use a sharp knife to slice into squares or bars. Wrap each individually and store in the fridge. These also keep well in the freezer if you prefer to make a bigger batch. 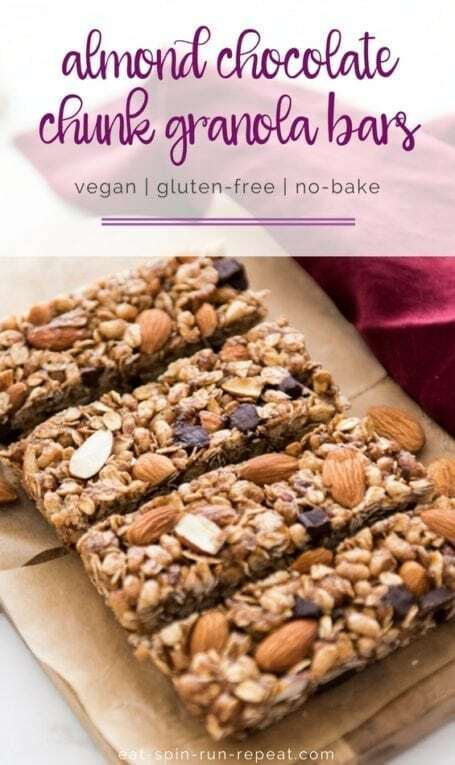 I’ve tried making variations of this bar with other liquid sweeteners to replace the brown rice syrup, but have yet to find one that actually holds the ingredients together well. If you happen to try and have success, I’d love to hear what you used! So tell me… are you more of an online or in-store Christmas shopper? Any gifts left to buy? Cant have tree nuts in this family so what would you suggest to sub? Thanks!! I’d love to hear if you give it a try and how they turn out! 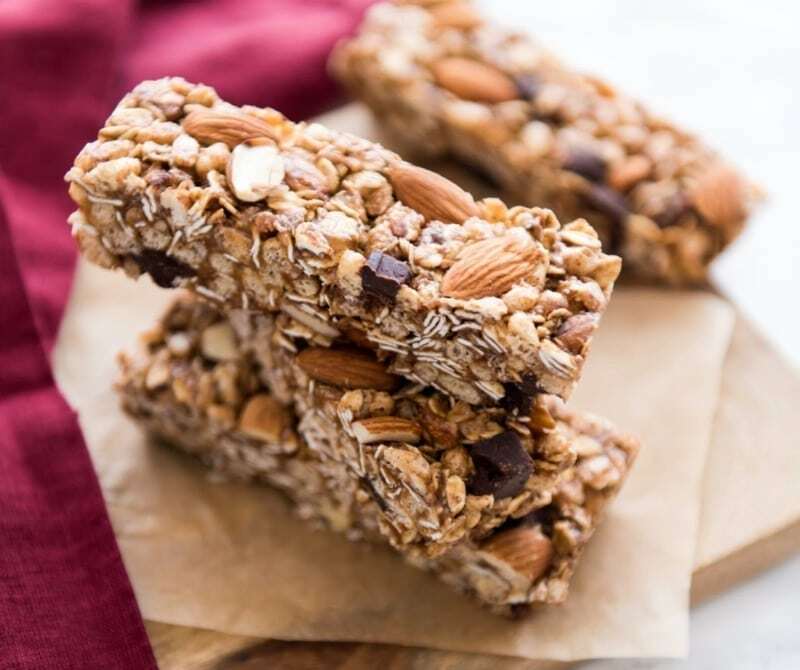 Perfect easy healthy snack to have on hand! And they look really good. ? Thanks Ashley! Would love to hear what you think if you give them a try! I have these setting up in the freezer right now! I assume you add the chocolate chunks after everything is mixed before pressing in the pan? At least that’s how I did it? Ooh fabulous! How did they turn out? And yes, chocolate chunks go in last. I also like to sprinkle some in the bottom of the pan before I pour the oat mixture in so that they appear on the top when I cut the bars. 🙂 Hope you loved these! These are so good! 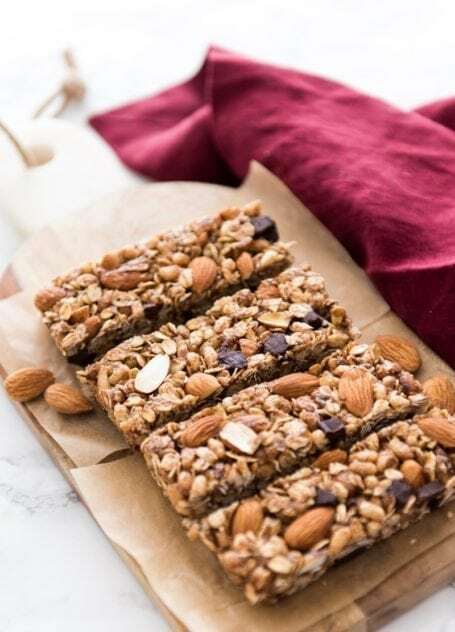 Thank you for a delicious and simple recipe that’s easy, healthy and quick!